Start your review of Calvin Alon. Send a message to Calvin Alon. Thank You! Your message has been sent to Calvin Alon at Whitby Oshawa Honda. I worked with Nick to find and purchase my HRV. From the first greeting and throughout the process Nick’s attention and customer service was exemplary and his knowledge of his product is thorough. Now that I own my vehicle, Nick remains consistent in caring about my satisfaction. He answers all my questions, investigates to find best solutions and remains patient and kind throughout. I would recommend Nick every time. I was very happy with the quality of service that I received from Nicholas Mohr during the process of picking out a New Honda vehicle. His knowledge of the vehicle and the available options was very helpful in making my final decision. His knowledge of leasing verses purchasing outright was also very helpful. Is also very pleased with Calvin Alon during the financing process. He didn't try to pressure me into addons that I didn't need or want. As an older woman buying a used car is definitely not my favourite thing. This was absolutely the best and easiest car buying experience I have ever had. The whole dealership is very clean, and the people are friendly and efficient. I felt I got a great trade-in price and love my newer, low mileage, lightly used CRV. The only extra I was interested in was a sanitizing /cleaning service for $150 which was well worth it. The car smelled wonderful and positively gleamed when I picked it up. John Baird was very pleasant to deal with and extremely helpful. I realized late Sat. night that I had forgotten my transponder in my trade-in so I sent an e-mail Sunday morning not expecting a reply till the next day at the earliest. But I received a reply literally within minutes on Sunday and John sorted it out on Monday. Tony was very helpful in assisting me with a trade-in and the purchase of an SUV. I walked into the dealership thinking that I was going to buy something used, but after speaking with Tony, it made more sense to purchase new. I am now a very proud owner of a 2019 CR-V Touring! Thanks again, Tony! 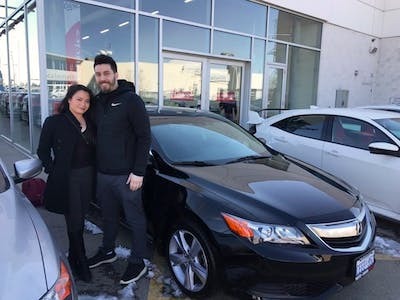 Dan O was exellent with customer service, called me back and kept on top of things to let me know about the honda civic that I later purchased, he was a very nice and professional gentlemen to work with. I checked out other dealerships but decided to come here because of Dan O's cooperation. Very happy with my experience here! "Employees in Honda are appoachable like Anna Sautner"
"A year later still waiting"
Had nothing but good things to say at the time, but it has been a year and I am still waiting on my interest cheque from dealer deferred interest, and everytime i call I am told they are looking into it or a cheque is in the mail... the word service doesn’t seem to mean that much here. When I hold up my end i expect people to do the same as well. "Easy, answered all my questions, friendly staff"
Remon was a great help. Flexible with booking a test drive. He answered all my questions and made the process of purchasing a car easy.